Our ladies' section has almost 100 members and we're really keen for new people to join us. Enmore Park is a beautiful golf course and you'll find everyone here very welcoming. Our "Women into Golf" programme is both affordable and comprehensive, and we start in April 2019 with "Bubbles and Balls"
As the name suggests this is a chance for a golf with a little bit of fizz! 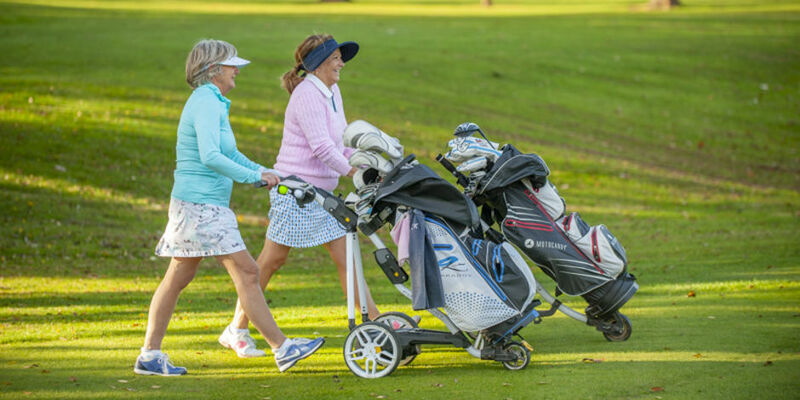 Enjoy a FREE two hour session with the focus on informal fun, where we'll hit a few golf balls, have a chat about the club, answer your questions and sit down for a glass of Prosecco or two. For a little more info and the dates please follow this link. Alternatively please follow this link to download our leaflet. After "Bubbles and Balls" we'll be running an eight week course in May and June for complete beginners to the game. The cost is just £80.00 which includes two vouchers to play the nine hole course for just £9.00 and you'll also be given a seven-iron to keep. During the lessons we'll be covering all of the basics of the game with tuition from PGA Professional David Wixon. David is a quite excellent coach and he'll have you hitting drives and holing putts in no time. As we progress we'll move onto the course to play a few holes and discuss things like etiquette and course management, continuing to answer questions as we go. Once the eight weeks is complete we hope you'll have been bitten by the golf bug, and we'll discuss your options for the next steps, possibly with a view to membership when you feel ready. What there won't be is any pressure, just make your own decision in your own time. Simply call the club on 01278 672100 (option 4 during office hours or option 1 on any day) and we'll take things from there. Remember, "Bubbles and Balls" is free, and there's absolutely no obligation to continue on to the £80.00 programme. However, we think that when you experience Enmore Park you'll be sorely tempted.